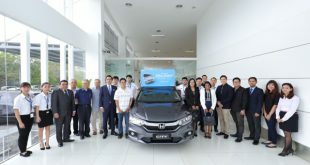 With surprise, Honda Malaysia gave the media preview of the brand New Honda City 2014 yesterday and will be display in public areas for public view as a move of pre-launch. There will be 4 variants for the first batch of official launch which is S, S+, E and the top of the specs V. Analyzing the Honda City on the display we suspect this could be the Honda City E Spec as Honda Malaysia did not mention what variant is this. Under the hood the Engine used will be the same 1.5L i-vtec engine which produces about 120 hp @ 6600 rpm and 145Nm of torque but pair with a new CVT gear box which replaces the 5 speed gear box. The new Honda City adapted the new Honda Jazz design to up trend the modern yet stylish design. The bigger openings of front lower bumper and the uplift headlamp gives new Honda City a more aggressive front fascia. However, Honda was able to maintain the previous generation spacious frame thus, the shape of the Honda City look familiar. Honda Malaysia also mention that there will be new CKD hybrid models coming up later this year. We see a possibility of CKD Honda City Hybrid. Like the title, Honda Malaysia was only given the media a preview of the the brand new Honda City & we are not able to unlock the car. Luckily our photographers were able to take some shots for our readers to view what would be actual production model. The flat type of centre dashboard reminds us the interior styling of VW Golf MK7. The Honda City will be equipped with tons of upgraded goodies, there will be an ECON mode, push start button, 6 air bags , smart entry , shark fin antenna and 8 speaker with 7 inch display for the In Car Entertainment system. Again, these equipment will varies from models. The new Honda City is available for booking and Honda Malaysia only indicated the pricing will be announced later next month & it will be affordable. Judging from the photos, there should be a few colours available including Black & Blue. The 2014 Honda City Malaysia version, will be display for public viewing in the following location and dates. If you eager to see the new Honda City before it hits the show room, do not miss this. More details will be update as we awaits the official launch date.